Today you’ll arrive in Uluru (also known as Ayers Rock). On arrival you’ll be transferred to your hotel where you’ll meet your tour guide and tour group. 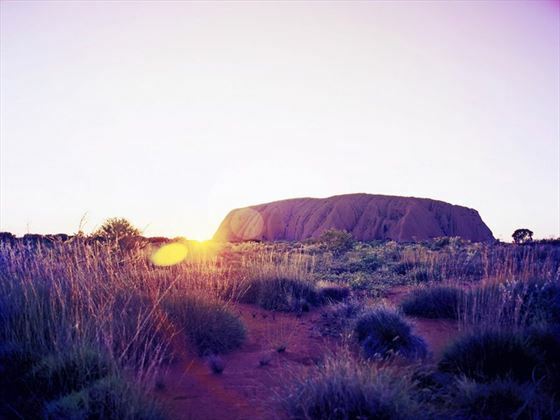 You’ll then travel to Uluru in the evening to enjoy the sunset with complimentary canapés and sparkling wine. 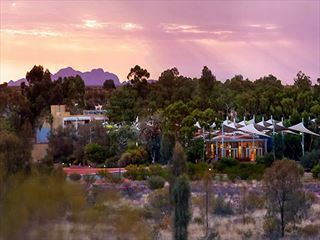 Early in the morning you’ll watch the sunrise over the incredible rock formation before taking a tour of the base of Uluru where you’ll learn about its history and the runs of flora and fauna that live there. Later you’ll visit the Mutitjulu Waterhole and the Uluru – Kata Tjuta Cultural Center where you’ll see fantastic examples of Aboriginal art. Finally you’ll take a walk around Kata Tjuta (also known as the Olgas) and enjoy another wonderful sunset in the outback. Today you’ll travel to Kings Canyon. 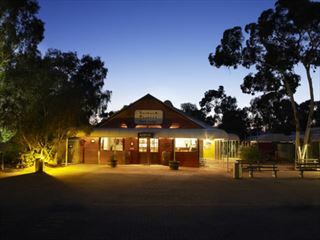 On the way you’ll take in some fantastic sights including Kings Creek Station. When you arrive in Kings Canyon you’ll go on a walk around the canyon which will allow you to enjoy fantastic views of Watarrka National Park. Telegraph Station and enjoy a visit to Anzac Hill for lovely views. 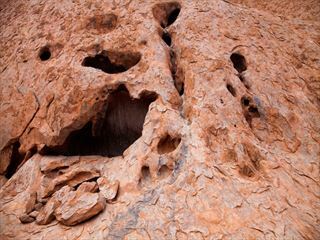 On day five you’ll get to learn about the local Aboriginal culture with a guide at the Alice Springs Desert Park. In the evening you’ll visit the Earth Sanctuary World Nature where you’ll have a delicious barbeque dinner. Today you’ll stop off to see the Royal Flying Doctor Service to learn about medical care is provided in the Outback. 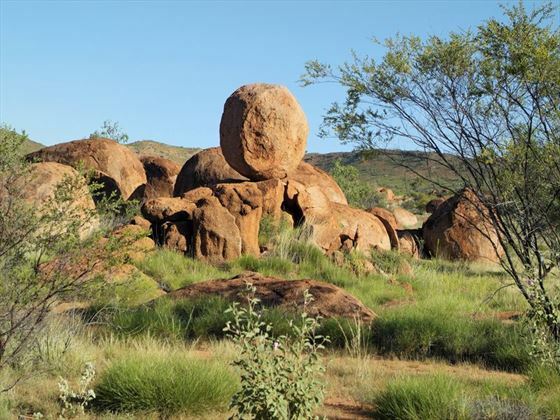 You’ll then travel to the Devil’s Marbles (known as Karlu Karlu). On day seven you’ll travel further across the Outback, making your way to Daly Waters Historic Pub for a refreshing ale and lunch. 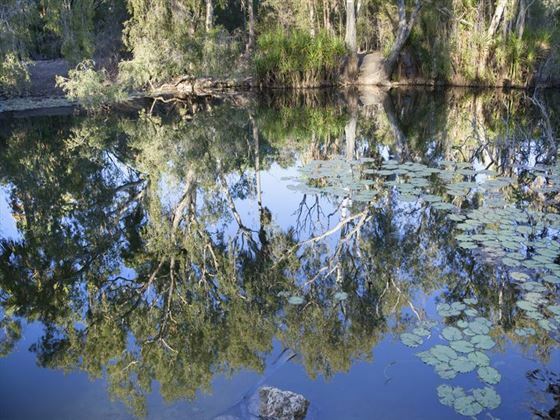 You’ll then head on to Mataranka where you can go for a swim in the famous thermal springs. Later you’ll continue your journey to Katherine. Today you’ll cruise through Katherine Gorge to see the impressive wildlife and Aboriginal rock art. 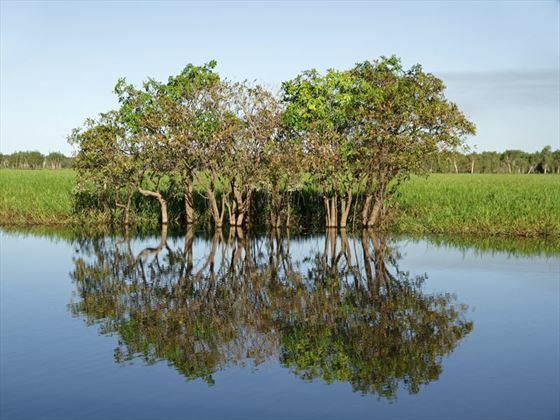 Afterwards you’ll head to Kakadu National Park where you’ll take a local cruise to Yellow Water Billabong where you can see amazing birdlife and even crocodiles if you’re lucky. In the morning of day nine you can opt for a scenic flight over Kakadu or simply relax. You’ll then head north to Ubirr where you’ll climb up through rock art galleries and be treated to sensational views from the top. 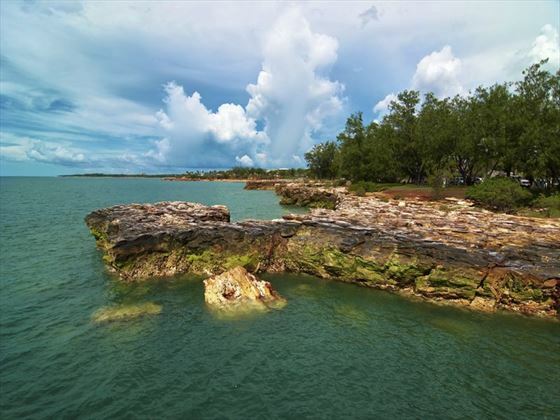 Later you’ll arrive in Darwin where you’ll take a guided tour of the city. 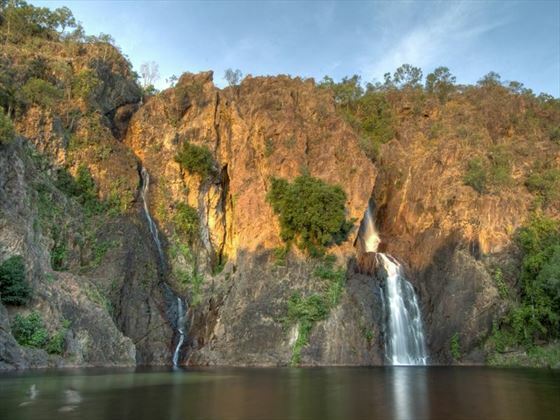 The next day you’ll travel out to the beautiful Litchfield National Park to see the wonderful Wangi Falls. Later you’ll return to Darwin and have a final dinner with your tour group on a cruise on Darwin Harbor. 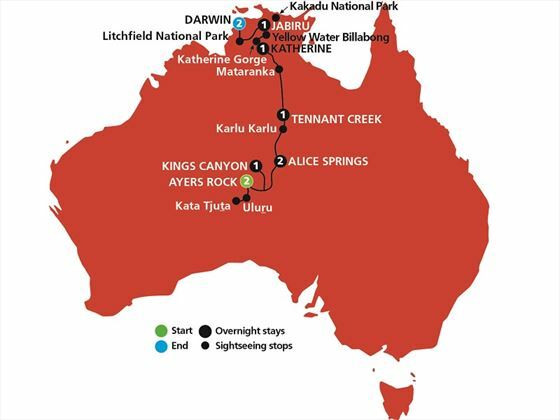 You’ll tour ends today after breakfast when you’ll be transferred to Darwin Airport to connect with your onward flight.